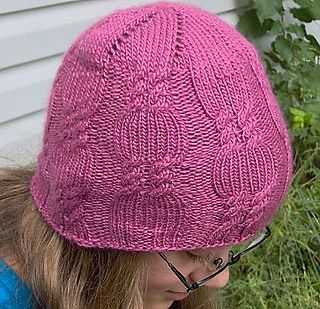 This easy to knit, unique, top-down hat uses only one 120 yard skein of worsted weight yarn. 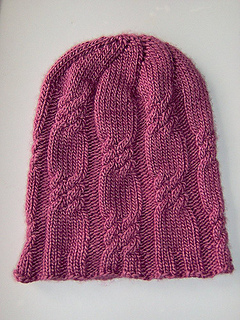 I designed it as the result of a challenge to “make a sample” from the touch-ably, soft new Silk & Merino yarn at my LYS. It has a beautiful spiral at the top and easy, double cable twists that look like candy wrappers. 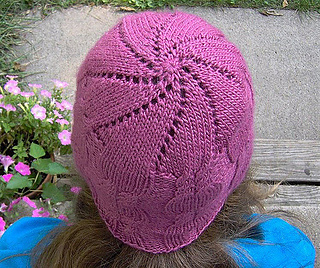 Hat is knit in the round from the top using Emily Ocker’s circular cast on. Pattern sized to fit Women’s small/medium or large.